Muscular dystrophy refers to a condition that solely involves the muscles while cerebral palsy affects muscles, hearing, speech, learning and thought processes. 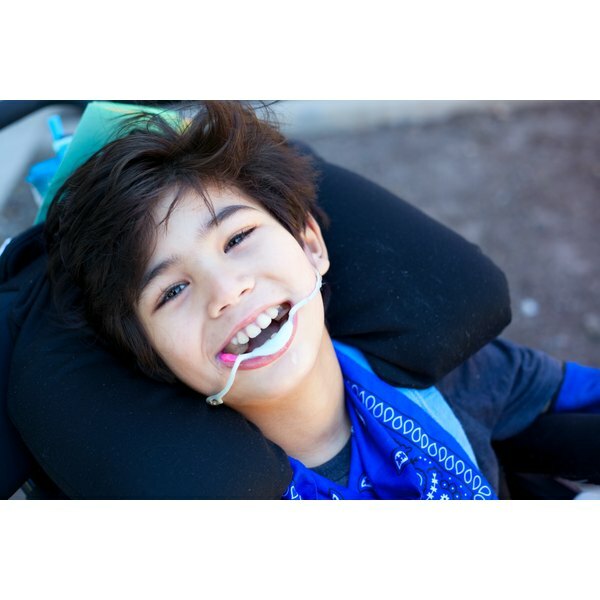 MedlinePlus says there are five types of cerebral palsy: spastic, dyskinetic, hypotonic, ataxic and mixed. There are seven types of muscular dystrophy: Becker's, Duchenne's, Emery-Dreifuss, limb girdle, myotonic, myotonia congenita and fascioscapulohumeral. MedlinePlus indicates that symptoms of muscular dystrophy include mental retardation and progressive muscle weakness, drooling, eyelid drooping and trouble walking. Cerebral palsy symptoms include muscle tightness, joint tightness, seizures, hearing and visual problems, constipation, urinary incontinence and pain. Treatment for muscular dystrophy includes taking medications such as corticosteroids and physical therapy. Cerebral palsy treatment includes such medications as muscle relaxants, anticonvulsants and wearing glasses or hearing aids. Complications of muscular dystrophy include an enlarged heart (cardiomyopathy), trouble breathing and scoliosis (curved spine). Some complications of cerebral palsy include scoliosis, seizures, a dislocated hip and bowel obstruction. According to MedlinePlus, muscular dystrophy is also called inherited myopathy. Cerebral palsy is also called spastic paralysis, spastic hemiplegia and spastic diplegia or quadriplegia. What Can Too Much or Too Little Potassium Lead To?